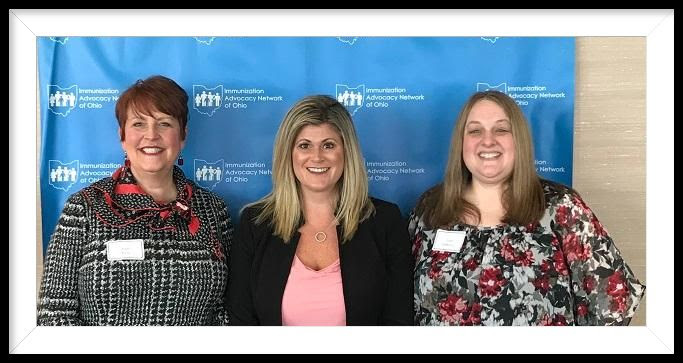 Advocacy day on March 19th started with a roster of experts who provided insights on immunization hesitancy and best practices being implemented to improve Ohio's vaccination rates. After the legislative briefing, advocates fanned out across the Statehouse and Riffe Center to meet with their local legislators. Melissa Wervey Arnold, CEO of the Ohio Chapter, American Academy of Pediatrics (AAP-Ohio), kicked off the event by noting that Ohio's place in national rankings of childhood vaccinations has seen little improvement and there's a lot of work to be done. Triangulating their approach, Ohio AAP is working to improve health care provider education skills, improve public education, and increase advocacy. Continuing to battle the spread of vaccine misinformation on the internet, Melissa shared that there is some good news. Public opinion is moving in the right direction. Amazon, Pinterest and Facebook are all pulling anti-vaccine content and merchandise from their platforms. Also, there is increased public awareness of the importance and safety of immunizations due to the recent outbreaks across the country. Ms. Wervey Arnold also briefed attendees on Parents Advocating for Vaccines (PA4V). This parent-led group advocates for better public health through childhood immunizations. Attendees were encouraged to engage in PA4V and help encourage families to share their stories. More information can be found on the PA4V website. IANO Day presenters, from left, Kate King, Melissa Wervey Arnold and Faith DeNardo. Ms. Wervey Arnold also quickly touched base on House Bill 132, languagesponsored by State Representative Don Manning (R-59th district) which would require schools to proactively notify the parent or guardian of each student of the exemptions from immunizations for school attendance. The Ohio AAP supports transparent, educated, and informed consent immunization legislation to protect Ohio's children from vaccine preventable diseases. While they appreciate the sponsors' intent for HB 132 to provide information to families about the school immunization mandate, the AAP and other vaccine supporters believe the bill gives families a "convenience waiver" to skip vaccinations and reporting rather than educating them. This could lead to lower immunization rates and costly outbreaks in Ohio. Document all school mandating vaccines. "In order to make the best public health policy decisions, we need stronger data," Ms. Wervey Arnold noted. "Families need to have access to data about immunizations on the school building level and making informed choices to protect all children in schools." Kate King, MS, BSN, RN, LSN, of Columbus City Schools and the Ohio Association of School Nurses (OASN), focused her remarks on the many ways that school nurses support students' academic success, by promoting wellness and prevention of illness. One of the main goals of the OASN is to decrease student absenteeism. Absenteeism and its ill effects start early - one in 10 kindergarten and first grade students are chronically absent. Poor attendance can influence whether children read proficiently by the end of third grade or must be held back. Also, by the sixth grade, chronic absence becomes a leading indicator that a student will drop out of high school. Provide school-located vaccination clinics and school-based health centers, in some areas of the state. The OASN is also working to ensure strict enforcement of exclusion policies in all schools, universal use of ImpactSIIS for vaccine record keeping; additional partnering with other stakeholders to deliver information and access to vaccines, and more advocacy for policies and legislation to increase immunization rates. We encourage you to visit the OASN website to learn more. IANO Day attendees were pleased to hear from Faith DeNardo, PhD, Director of the Bowling Green State University Wellness Connection and current president of the Ohio College Health Association (OCHA). Ms. DeNardo shared that the OCHA is a member of the American College Health Association, and their mission is to provide advocacy, education, and communications, as well as promote research and best practices to advance the health of all students and the campus community. DeNardo shared that OCHA was recently invited by the Ohio Department of Health to sign a letter that will be sent this spring to Ohio colleges and universities, reminding them to continue to utilize national, evidence-based standards as recommended by the Advisory Committee on Immunization Practice when immunizing the student population. The letter was also signed by the Ohio Chapter, American Academy of Pediatrics and the Ohio Public Health Association. Learn more about OCHA by visiting their website. Lobbyist Matt Whitehead once again offered immunization advocates a primer on how they can educate lawmakers about vaccines and become a trusted source of reliable information. He also reminded attendees to invite their local legislators to visit their organizations back in the district. Mr. Whitehead also touched briefly on House Bill 132. Stay tuned for updates on this legislation. IANO will be in touch with possible action alerts and need for engagement IF this bill progresses. IANO's Immunization Advocacy Day once again demonstrated that broad support exists for education and outreach about vaccines. A record 70+ advocates, legislators and legislative staff attended the briefing session. Advocates came from all parts of Ohio, from rural and urban areas, representing public and private organizations. Veterans of past events teamed up with first-time attendees to meet with legislators in the House and Senate, who expressed appreciation at hearing from residents of their own districts about this public health issue. Thank you to those who were able to attend and meet with legislators. Many of you reported back on your meetings and that feedback is very helpful.